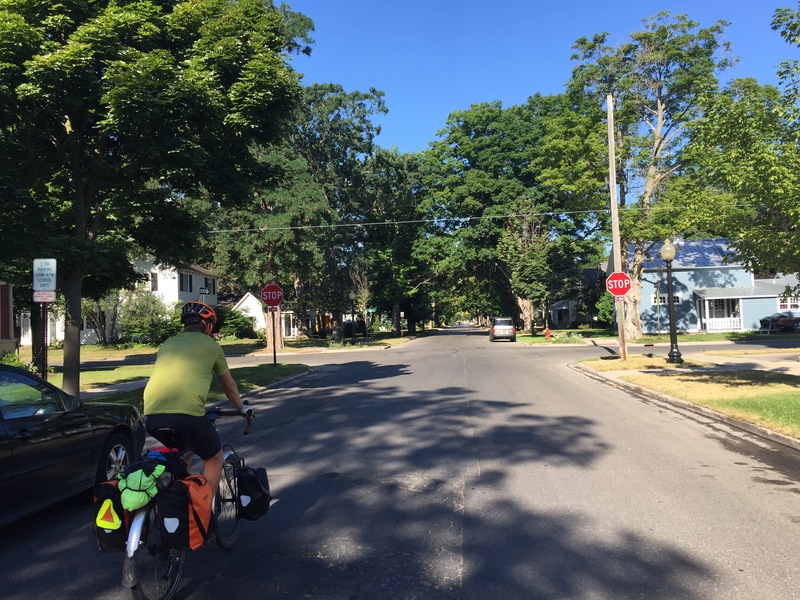 Day 49, 8/1, Traverse City, MI to Sunrise Lake State Forest Campground, LeRoy, MI: 90.8 miles, 3,376 ft elevation gain, 12.6 mph average speed. Trip totals: 3,022.9 miles (72 mile daily average), 125,686 ft elevation gain, 12.5 mph overall average speed. It’s August! Only two weeks before the tour ends! I can’t believe we’re this close to being done, but every time I think about being almost done, I remember that we still have close to (or just over) 1,000 miles left to ride. But just for fun, here are a few facts about July: We rode on 25 out of 31 days in July, including 25 out of the last 26. We climbed 67,310 ft (according to Ride with GPS, so less than that in real life), and rode 2,041 miles for an average of 81.6 miles per day. Our longest day was 129.2 miles, and our shortest day was 46.6 miles. Back to today. So, a beer here or there to relax after a long day of riding is well and good, but from here on out, I think we’ll keep it to one. I can’t drink like I have nothing going on the next day and then get up and ride 100 miles. I groggily slapped at my phone when the alarm went off at 7:30, and sleepily started putting all of our stuff together. Pauly made us promise to wake him up before we left so we could all go to breakfast together, so we did. But when we went outside to put our bags back on our bikes I realized that a) I didn’t know where my wallet was and b) I had yet another flat rear tire. Dani quickly found my wallet for me, but I still had to change the tire. I took the tire off the rim to try to figure out why my tire is going flat every couple of days. I noticed that one of the tire boots I used to cover the gash that I picked up on I-94 way back in North Dakota was chewed through. It seems like the pressure of riding somehow causes the gash to expand and contract, chewing through whatever is in it’s way, be it tire boot or inner tube. I think that it might be time for me to get a new rear tire, but we’re so close to home. I decided to try a trick that I learned yesterday from the guys at the bike shop. They told me that if you folded a dollar bill over twice, you could put it in your tire and it would be as strong or stronger than a tire boot. Apparently Uncle Sam makes his money to last. I’m trying it out, and we’ll see how long it lasts! After I got the tire inflated again, we headed out to breakfast. 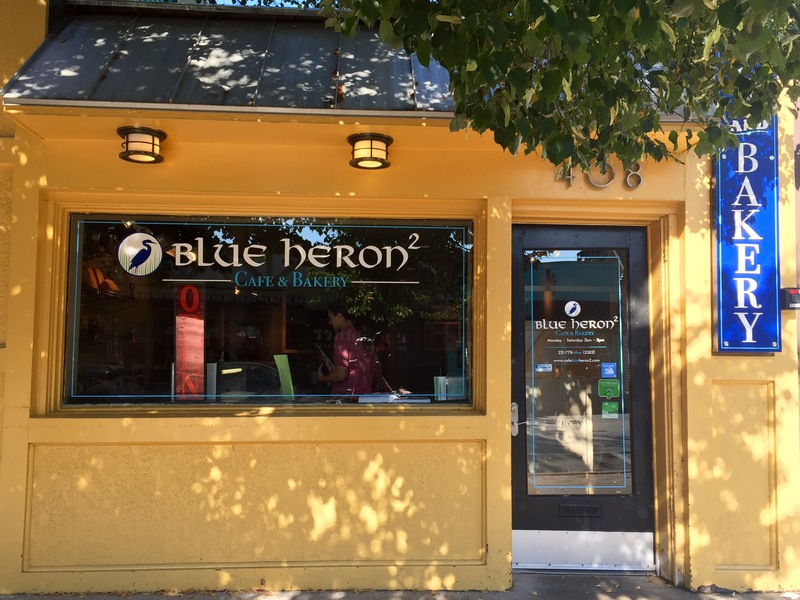 Pauly took us to an amazing little cafe called The Blue Heron. Oh my. This was probably the best restaurant breakfast we’ve had this trip. We both got chorizo bowls, which came with homemade chorizo, black beans, peppers, sharp white cheddar, two eggs, and amazing homemade bread. Holy freaking moly. What a meal! By the time we were finishing up breakfast, bike shops were starting to open around town, and I stepped outside to try to find a replacement tire. It turns out that not all bike shops are as well stocked as Dakota Cyclery in Medora. No one had the tires I need. I guess I’m going to be relying on the power of the dollar for the last two weeks of the trip. We got on the road a little after 9:30, which is the latest we’ve started in a while. We still hoped to pull a 115-mile day, but that was only going to be possible with a little luck and a lot of determination. We started the morning riding through Interlochen (our planned destination yesterday), and it was beautiful. There were giant trees lining the road, lending a sort of enchanted storybook forest feel to the ride.There’s a renowned arts academy there, and everything was pristinely maintained. It was a wonderfully pleasant way to start the day. The riding was easy, the roads were smooth and had wide shoulders, and the shade from those giant fairyland trees kept us cool and happy. 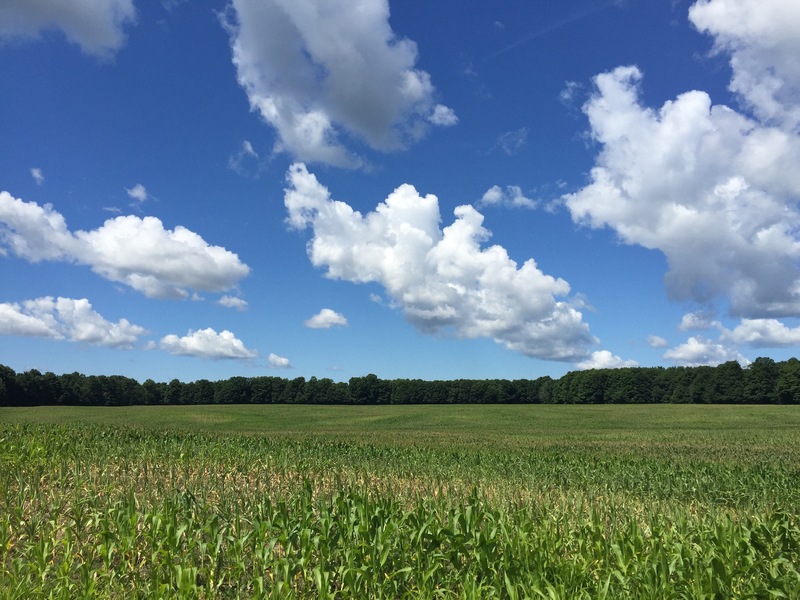 Around 30 miles into the day, we had ridden away from those wonderful shady trees and into corn fields. 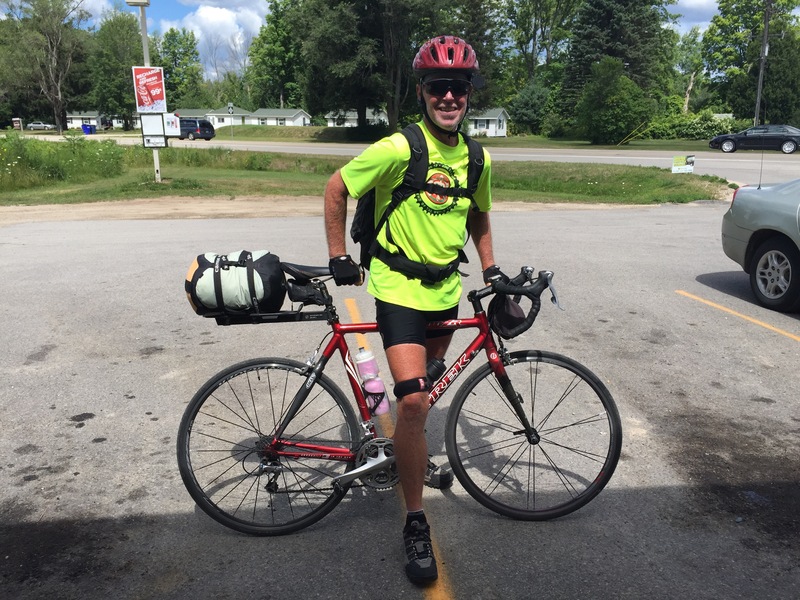 We pulled into a BP station in Mesick, MI, and were excited to see another touring cyclist at the gas station getting ready to pull out. His name was Richard, and he was touring alone on a road bike with a stuff sack on a low-capacity rear rack and a rucksack, as he called it, on his back. We heard a lot about Richard from Steph and Tom, and he’s quite the interesting guy. We ran into him again, but he left pretty soon after we showed up in Mesick. The other event of note from this break was my invention of one of the most delicious snacks I’ve ever had. A piece of fudge (I think peanut butter is ideal, but all flavors work) sandwiched between a couple of salt and vinegar potato chips. You should double up on the potato chips to get the right ratio of salty to sweet. TOBIFAS for short, Ted Olds’ Brilliant Idea for a Snack is the perfect midday energy boost on a tour. Interested sponsors should email me. Ha! 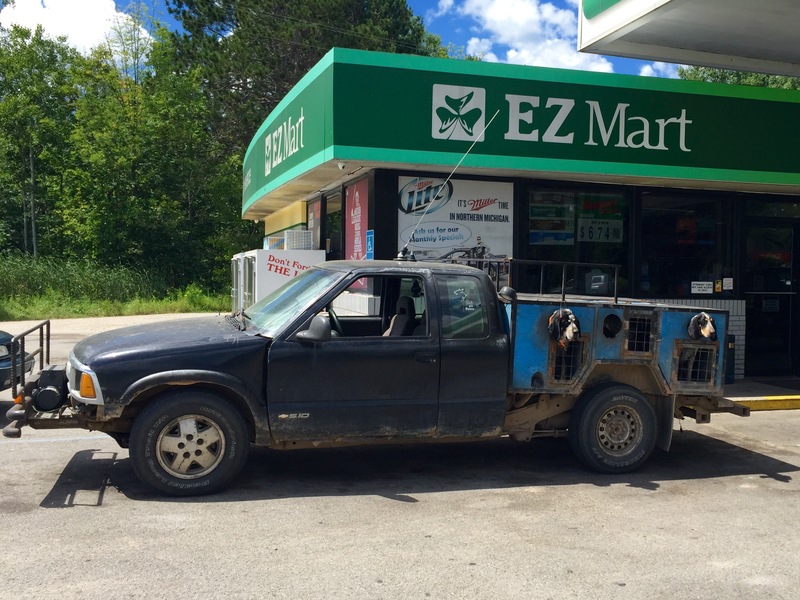 As we were pulling out, we noticed this homemade dog carrier with five hunting dogs’ heads comically hanging out of the windows on all sides of the contraption. After our break, we turned south onto State Route 37. It sucked. Lots of traffic, a small shoulder, and that persistent southwestern wind. Grumble grumble. The lone bright spot of this stretch was seeing an eagle soaring over the roadway. 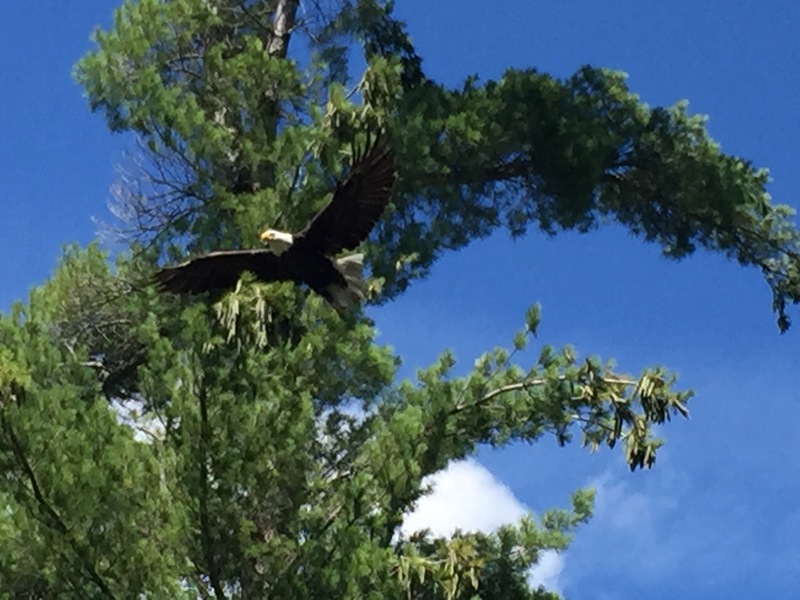 It swooped down in a half-dive right over our heads before pulling up and flying back into the trees. Sixty miles into the day, the heavens opened, the sun shone down, angels sang, and we turned east. The first three of those events may have been entirely in my head, but boy was I excited. 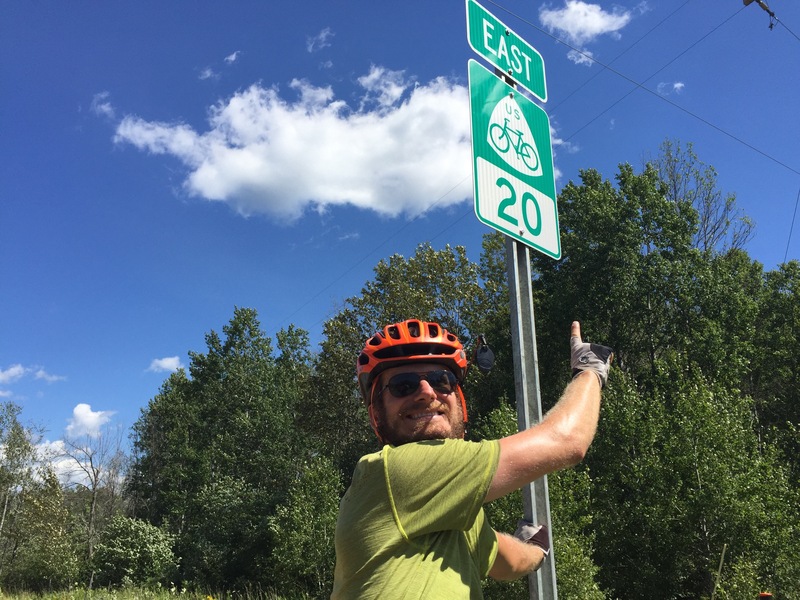 From here until Canada, we’ll be following US Bike Route 20, and we’ll be going east. As we rode down the semi-decent road, I savoured the lack of wind in my face and the ease with which I spun my pedals in the top half of my gearing. Shortly after we turned east, we were passed (politely) by an older pickup truck. We rode on for a minute or two and then noticed that the truck had stopped in the middle of the road a few hundred yards ahead of us. We exchanged looks and slowly continued forward, wondering what was happening. As we got close, the occupants started gesturing vigorously toward a tree on the side of the road. It was another eagle! 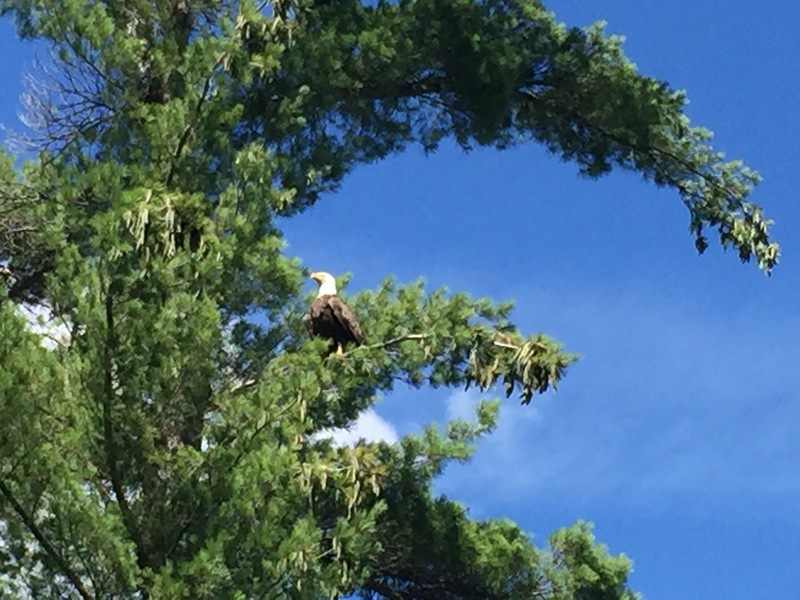 This one was perched majestically near the top of a pine tree, staring down at us without a concern in the world. We stayed and watched him until he flew away. A few easy miles (I love it when I can use that adjective) later we rolled into Luther, where we stopped at a park near the beginning of town and ate tuna, cheese, and triscuits; fruit; and oreos for lunch. Then we continued on to LeRoy, and except for a brief stint heading south again, the miles just fell away. After a cold drink pit stop (incidentally, Arctic Cherry Gatorade is not very good), we headed out of town, the wrong way, which we discovered after we climbed a hill. We turned around and headed back to the route, and we heard a shout as we were passing the town restaurant. It was Richard! We swung in to say hi, and he told us that he was staying at the state forest campground a few miles down the road. We were planning on trying to go about twenty miles further, but then we discovered that those campsites were charging upwards of $30, so we decided to stay at the $13 dollar state forest campground as well. We made it to the campground and set up camp, then Richard arrived about 10 minutes later and accepted our offer to share our site with us. Sunrise Lake State Forest has a truly primitive campground. The only amenities are pit toilets and a water pump. But who needs a shower with a lovely lake across the road? We walked down to the lake, sat down in the shallows, and washed up the best we could. I might have been on the receiving end of a few looks as I was scrubbing underneath my shorts, with soap suds coming through the fabric, but the end justified the means. Back at camp we started to get to know Richard, who was in some ways the third and most memorable eagle of the day. I’ve been avoiding describing him up until now because I don’t really know how. He is one of the most interesting people I’ve ever met. He is an older gentleman in his late-60s and decided to do this tour “on a whim.” He is earnest and friendly, a man you immediately trust. He is retired military, and although we never learned exactly what he did, some things he said (like “I just did what my elected officials told me to do”) make us think he held a pretty high rank. When we asked him about the places he toured in the military, he listed a half dozen countries in Africa, several more in Asia, pretty much all the European countries, and “you name it, I’ve been there” in South and Central America. So pretty much the entire world. It was the closest Dani has ever come to wanting to join the military. His rules of retirement are that he refuses to wear a watch, answer a phone, or work on a computer. He relishes physical challenges. 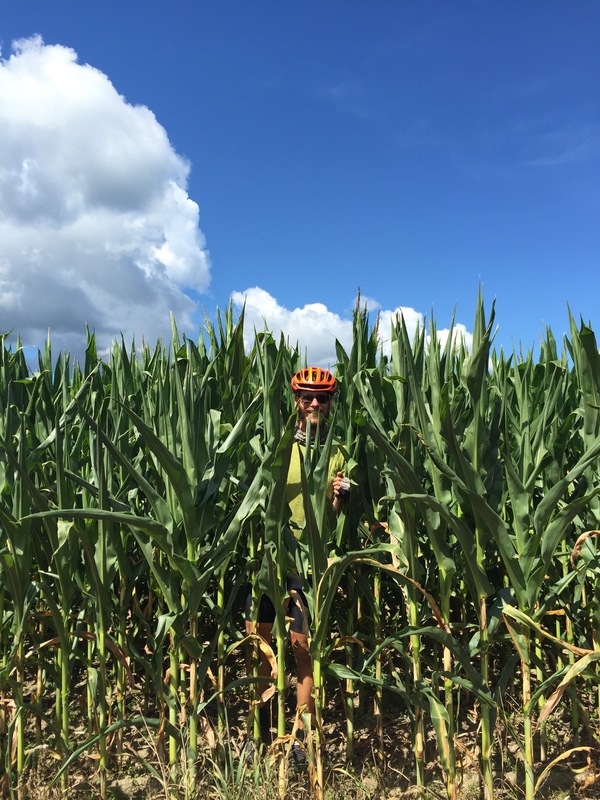 In addition to riding across the country on a whim, he has hiked the entirety of the Appalachian Trail, the Continental Divide Trail, the Pacific Crest Trail, and a handful of other national scenic trails. And he does it all without any sort of electronics, other than a device called a Spot that he uses to send a nightly GPS signal to his wife so she knows where he is, a device that arrived under the Christmas tree one year, much to his chagrin, and that he described as a compromise with his wife. And he is kind and earnest. I know I already used that word, but I think it’s rare to meet someone for whom it is appropriate. He carries no hint of agenda or dissembling. He believes in the decency of people, and after traveling the world decided to live in South Dakota because he thinks that people treat each other right there. He is also taking an orderly and disciplined approach to this bike tour that seems, at once, strict and relaxed. Richard wakes up naturally when the birds start chirping every day (no electronics means no alarm clock, but he doesn’t need one), packs up, eats a granola bar, and rides to the closest town down the road for “morning chow.” He takes a good break, 30-40 minutes, every 15-20 miles. 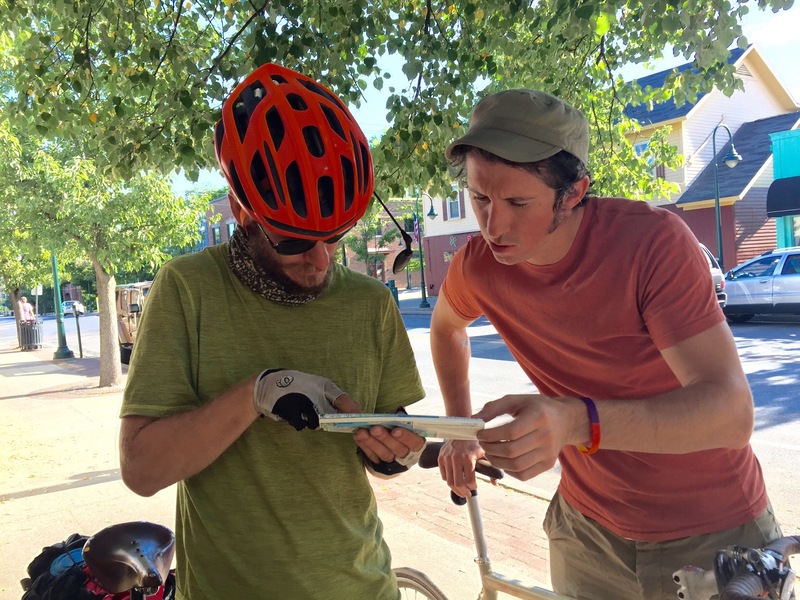 He memorizes the next section of the map during each break (this man has an incredible memory), sticks the map in his pocket, and just rides. Richard is relying on restaurants for every meal because he did not bring a stove, so he looks for a restaurant before getting to camp for supper. He gets to camp, washes up in whatever source of water is available, does some bike maintenance, and goes to sleep early. He takes a “zero day” every 500 miles or so to keep himself fresh. Richard does absolutely nothing on zero days–all he will allow himself to do is read a book to allow for total physical and mental rest–so he makes the day before a zero day a short day to allow time to run errands. Systematic, yet he seems much less high-strung than we often do. We have so much to learn from this guy. He is a complex and fascinating dude. I wish I had the opportunity to get to know him better. But it was time to go to sleep, and so we did.